If there's no 7, 8 9 or 10, I don't want it. I'm somewhat doubtful that it will be another MegaMan compilation. But if it is I hope it's either a compilation with MegaMan 7-10 and M&B or a compilation of another Mega Man series. Mega Man X Legacy Collection, please. C'mon, the series needs some recognition. Or a compilation for MMI-MMV for GB with color update. Or Mega Man Legacy Collection 2 with MM7,8,9,10, and MM&B. Maybe a compilation of the game boy games? Doubt it, but I'd love for it to be Star Force collection or Battle Network collection, those two series are seriously in need of compilation releases, and both actually have something to gain from them, such as japan exclusive content for example, and specifically in Star Force's case all of it's online components back in tact as well as a resolution boost. Both series exist in their entirety on one platform so like Legacy Collection they shouldn't have to worry about developing for multiple systems. I hope Capcom at least considers giving these compilations a go, they're literally the only MM collections left that I actually want to be made. They seem to go on a per system basis, hence doing only Mega Man 1-6 with the legacy collection. With that in mind, I think a Battle Network Compilation could be it, if it is a Mega Man project. I doubt it would happen, but I'd love to see the X Collection we never actually got. I agree. And even though the original English dub part of its legacy I'd love a professional redub of MMX4. X4 needs a new dub. People should shut up about that crappy unprofessional dub that wasn't even the U.S.'s fault (it was the Japanese Capcom branch that was responsible). Man what i wouldn't give for a updated comp of the Game boy games especially Megaman 5 that one had best story of the old series and still to this one of the best megaman games to ever grace the franchise. I want a new title, im so sick and tired of compilations! If the next compilation is another Mega Man one, and it features Mega Man 8, I'd like for it to be the Saturn version (remastered soundtrack, new Tengu Man music, Bonus Mode, boss battles against Cut Man and Wood Man, etc.). Alternatively, I want Mega Man Mania (A.K.A. the GBA version of Anniversary Collection) to be resurrected. X Collection please, and this time don't leave out the last ones. We still need MM7 and 8 on current machines. Mega Man X Collection, pelease ? Please ? Or Mega Man 7,8,9,10 and special never released SFC version for English (Minus GBA version). I'm going to go out on a limb and say that it may not be a Mega Man compilation - a part of me wonders if it might be a Disney NES title compilation, as Capcom put out some very good games out of the licenses of the day. I won't get my hopes up... But I really hope Capcom makes a Megaman legends collection in the future with Megaman legends 1/2 and Misadventures of Tron Bonne as an unlockable, they can even put comcept art and music as extras...But I know that will never happen I mean they can even use it as a test to see if the Legends series can still sell well and If they put something like that on the 3DS too I will take that as some kind of apology for the cancellation of Megaman legends 3. 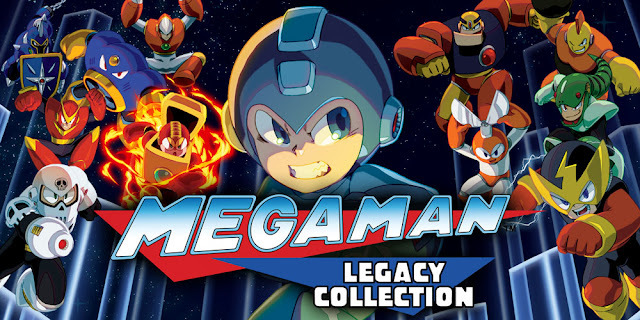 The collections I hope they would annouce is a complete mega man legacy collection with mm 1-10 and the snes version of mm&bass. They could also put in the power fighter games and mega man battle and chase as extra games. Or a new mega man x collection including mmx 1-8 with mmxcm as a extra game. They could add new arranged music for x1-3 as a optional choice while still including the original music for people who prefer the original music. For x4-6 they could include new english voice acting and the original voice acting (which means new voice acting for x5 too since it had none.). What would be really intresting but impossible is if they added local co op back to x7 and put local co op in x8. However I know none this would ever come to pass. What we are probably getting is more nes capcom collections or a snes megaman legacy collection 2 featuring three snes mega man games and three x games which be mm7,mm&bass,mmsoccer and x1-3. That would go back to there "six mega games one mega deal nonsense." Or they are doing some other collection thing. Highly doubtful that it's even Capcom related. He never said it was for Capcom, nor that it was Mega Man related. That's true I just hope that whatever collection he does next is good. Well, Capcom just announced a Disney Collection so it's probably that.